Meet Nancy J. Ondra, Plantswoman! Nancy J. Ondra is a renowned garden writer and editor with more than 30 years of experience growing and experimenting with perennials and plant combinations. She is the author or coauthor of more than a dozen respected gardening books. In The Perennial Matchmaker: Create Amazing Combinations with Your Favorite Perennials, she has distilled her in-depth knowledge of color, texture, and seasonal effects into a simple approach for surefire planting success. I’ve been gardening my entire life, got my first job as a teacher! Fall is a good time for moving a lot of things. Tell us about something that grew well this year. Tell me about something that didn’t work so well this season. Let’s take a minute to thank our affiliates! Now you can get an Organic Gardener Podcast discount at organifi.com use promo code OGP16 (that stands for organifi.com use promo code OGP16 (that stands for Organic Gardener Podcast 2016) at checkout for a 15%discount! 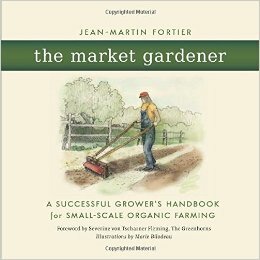 Learn about biologically intensive farming in Jean Martin Fortier’s The Market Gardener either on amazon or audible and learn how to be a profitable market gardener. If you’ve never tried audible you can get a free audio book from the Organic Gardener Podcast and audible today! Which activity is your least favorite activity to do in the garden? Right it takes a long time. And it’s never as good as the rain! I hate wasting water, it’s never good enough. Mike’s always like did you water today? And I’m like I watered yesterday. Nothing like the rain. What is your favorite activity to do in the garden? Got any tips for listeners? if you’ve grown things from seed you know what you’re looking for. if you’ve grown a zinnia from seed you’ll recognize the seeds. Just give it a try. It’s really not that hard. preserving a favorite you’ll have seeds to share too! Right, there’s always so many seeds in each flower etc. if you have a big area that you are that youa re digging or mulching or you’re weeding, orient yourself so that you are always looking at what I did and not what I have to do. That’s gotten me through a lot of big products. A favorite tool that you like to use? If you had to move and could only take one tool with you what would it be? But they look basically like a garden scissors, they work like scissors but they are sort of a cross between scissors and pruning shears! work as a professional gardener, these are almost attached to my hips. places that sell animal tools. self-sharpening. I’ve used them for years and not had to sharpen them. I eat anything that doesn’t need to be anything but chopped. google images is almost always on my desktop searching for pictures to compare. spend hours on Pinterest looking for plant combinations gardening ideas. I probably should have said that first Pinterest. A favorite reading material-book, mag, blog/website etc you can recommend? I didn’t really spend much time reading about gardening I’m more like doing it. published in Britain but they have gardens from all over. oh I’m participating this month! everybody has something to share even if they are a beginner gardener. I also use blogging as a garden journal. It’s the only form of garden journal I do because if i want to remember what this looks like later. It’s a great resource for anyone that has a record or projects of what worked and didn’t work. I would encourage anyone whether they want to be a garden blogger or keep just keep good gardening records. I had a blogging challenge once, and it was like write 10 posts a month which is like Monday, Wednesday, Friday for a month but don’t publish it. And just see what happens after a month and either you’re gonna love it an publish and keep going or your not. But just do it and practice because no one’s gonna read in the beginning anyway and you want to make your mistakes before people are looking anyway. if there was one change you would like to see to create a greener world what would it be? For example is there a charity or organization your passionate about or a project you would like to see put into action. What do you feel is the most crucial issue facing our planet in regards to the environment either in your local area or on a national or global scale? I just makes me a bit sad, to think as plants as lifestyle accessories rather then living things. It’s so easy to go and people do it everywhere and just buy an already growing plant and stick it in a container and its there. not being cognizant of the natural cycle of plants. People want plants to do certain things and the plants don’t do that. natural cycle of them growing and blooming and dying! people get so upset. Well that’s just the nature of plants. then you have space to plant something else. How do we connect with you? I blog once a month! That’s sounds awesome, not so intimidating. My November thing I like to give away seeds so I have a seed giveaway for readers! Listeners if you do get one of Nan’s wonderful books make sure you review it on amazon because that’s so crucial for authors! If you like what you heard on the Organic Gardener Podcast we’d love it if you’d give us review and hopefully a 5 star rating on iTunes so other gardeners can find us and listen to. Just click on the link here.